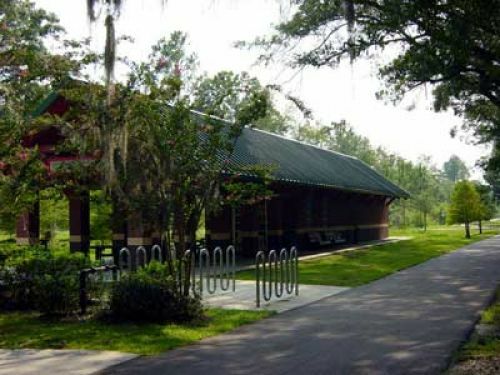 The Jacksonville-Baldwin Rails to Trails is the first segment of what will be a comprehensive greenways and trails system made possible through numerous partnerships between the City of Jacksonville and other organizations. Only about 5 miles from downtown Jacksonville, this 14.5 mile-long multi-use trail traverses creeks, pine flatwoods, and upland hardwood forests. In addition to enjoying the native surroundings and wildlife, trail enthusiasts have the opportunity to visit Camp Milton, a documented Civil War site containing a Confederate works berm. The City of Jacksonville has purchased additional lands buffering the trail, and separate equestrian and mountain bike trails are planned. The trail was selected as one of the field trips for the 2003 National Public Land Acquisition and Management Partnership Conference.